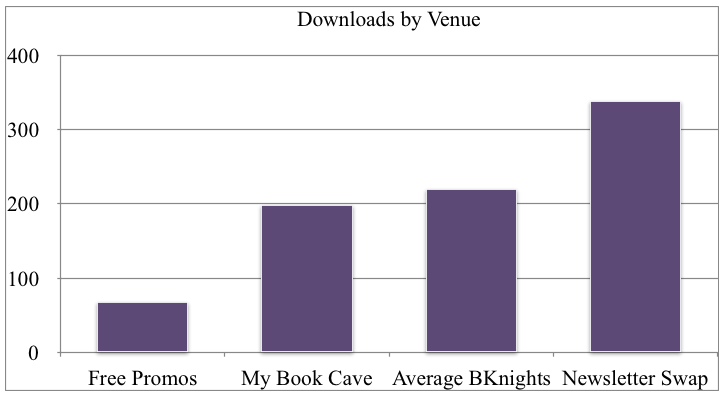 My author friend Autumn Birt recently shared her results with promoting a free book on various smaller promo site. 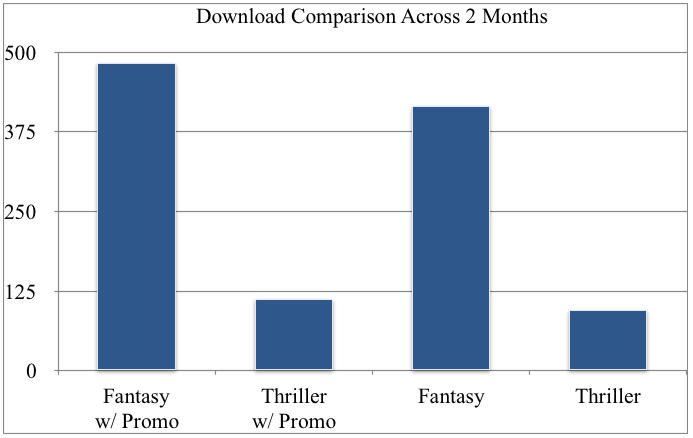 Specifically, she wanted to test her hypothesis that by submitting two different free books (one fantasy and one thriller) on several free advertising sites every day for 30 days, by the end of the period she would see a greater number of downloads compared to the previous 30 day period, when she was doing no promo whatsoever. 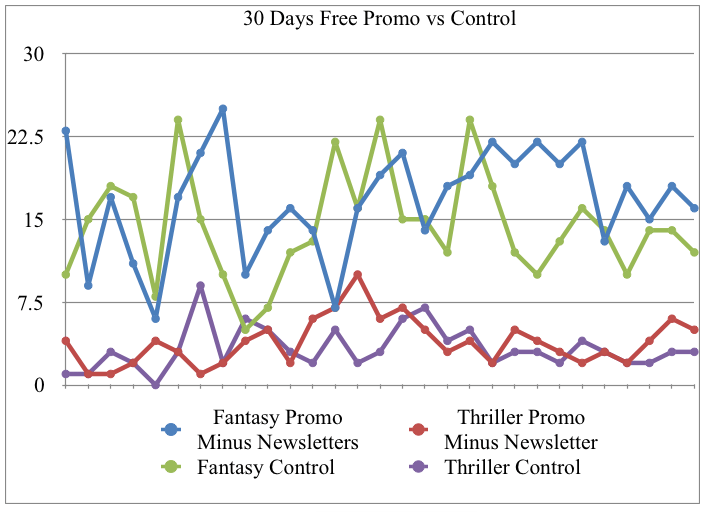 In fact, as she points out, if you look at total downloads from the control month versus the 30 days of free promo… well, can you tell which bar is for which month? I have to admit, her findings took me aback. There seems to be little to be gained from spending the extra time submitting to all these free promoters. Also, as Autumn points out, she doesn’t even know if any of those sites actually used her submission. Most have no communication after submission. So there really is no easy way to know if her books were featured. And some of these sites were cluttered with advertising, and make no promise to get in touch with you but still want your email… you really have to ask yourself, why do they want it? In fact, she knows for a fact that at least one of those websites sold her email right away. Because as well as unsubscribing to about 20 newsletters, she’s been getting some crazy offers for an assortment of items she never signed up to receive – including an igloo cooler! For more information on her experiment and methodology, be sure to check out Autumn’s full post on her blog. Well… I don’t kno wwhether take this as a relief or a disappointment. I’ve done only a couple promotions, both free, one for a free book (which resoulted in a few downloads) and one for a 99c book (complete disappointment). I was convincing myself that I must have done something wrong, but after reading this I wonder whether the free promo sites themselves aren’t ineffective. I also wonder whether there is any good in promoting a book at 99c anymore. When I promoted mine, I could check out the placement on the site (I don’t even remember the name, now). It was listed together with a lot of free books, which I think accounts for the very disappointing results. Besides, people seem to have gotten used to have everything for free on the net, so I wonder whether any other promotion is losing interest with the readers. Thanks so much for sharing this, it was very interesting. I wish I had a clear answer to your comment. It feels like we’re all building on quicksand, and what works one day won’t work the next. Very interesting info here. Thanks for sharing. Perhaps the effort wasn’t worth it, given those charts. But overall, it seems to have done no harm either. True. Plus, we got to find out about Book Cave. Closing doors is as useful as opening others! Generous of you and Autumn Birt to save others going down cul-de-sacs. I have tried one or two paid promotion with nil results. Thanks for this post. Interesting results. I’ve found that the free promo sites don’t have much impact, but then again, they’re free, so why not. Book Cave sounds like one that’s worth the effort. Thank you both for sharing your findings! Full of surprises. I always thought those sites were a guaranteed increase. Seems I shouldn’t always believe the hype.